At first look, Rokka: Braves of the Six Flowers looks to be yet another anime following the archetypical fantasy plot of a group of heroes journeying forth to defeat an evil demon god. However, the anime’s true form is that of a locked room mystery where the only person who can solve the crime is also the sole suspect. In the world of Rokka: Braves of the Six Flowers, there was once a Saint, a powerful woman with powers given to her by the gods, who saved the world from the Demon God. However, despite being defeated, the Demon God was not destroyed and would rise again every 300 years. Thus, the Saint set in motion a sequence in which each time the Demon God returned, the world’s six strongest warriors—called “Braves”—would be chosen by fate and infused with her power so that they could combat the evil god. For the first four episodes of the anime, Rokka seems like your standard “defeat the demon king” fantasy—but with a unique Aztec-like setting. Adlet is chosen as one of the six Braves and begins traveling with fellow Brave Nachetanya—a princess and the Saint of Blades—to meet up with the other four at the gateway to the Demon God’s lands. Along the way, they fight demons and encounter two other Braves: Flamie, the Saint of Gunpowder and a woman with a dark secret, and Goldov, Nachetanya’s superhumanly strong guardian. However, as Adlet and the other Braves arrive at their rendezvous point, they find themselves trapped in a forest by a magic barrier. Worse yet is that seven Braves have gathered instead of six—meaning that one of them is an imposter working for the demons and is responsible for trapping the rest. Luckily, there is one, surefire way to dispel the barrier: Kill the person who activated it. Unfortunately for Adlet, the situation is soon revealed to be a locked room mystery where the only person who could have possibly activated the barrier is Adlet himself (though, as he is the viewpoint character, we know from the start he is not responsible). Thus, Adlet must somehow prove his innocence, figure out the secret of the crime, and discover the true culprit—all while being hunted by the other six most powerful warriors on the face of the planet. The best thing about the central mystery of Rokka is that it is a fair mystery. All the clues are shown on screen—though you likely won’t recognize them as clues at first. There are no directorial tricks used to hide key facts and no hallucinations or the like designed to mislead the audience. However, the mystery is still complex and difficult to figure out. This largely comes from the fact that the anime is seen entirely through Adlet’s limited perspective. We, as the audience, only know what he knows. And while Adlet is a master of science (something we, living in a world of science, are also familiar with) and the biology of fiends, he knows little about the Saints, their powers, and the limits of said powers. To Adlet, as to us, the Saints’ powers are simply magic. Of course, as the anime continues on, Adlet learns more and more about the nature of the Saints’ powers and, thanks to that information, all eventually becomes clear. For better or for worse, there is a second way to figure out the mystery, however. If you know anything about typical mystery narrative construction, you can use it to figure out who the traitor is quite early on. Often in mystery tales, the author will go out of his or her way to make one character seem beyond suspicion. They will be kind and loyal to a fault—also often a love interest to the protagonist. Because of this, it is supposed to be all the more shocking when this person is revealed to be the true villain. Of course, as this is such a common tactic, seeing a character develop this way is tantamount to a giant sign above his or her head reading “VILLAIN” in all caps. Another high point to the series is its cast. Every character has his or her own secrets, motivations, and personality quirks that makes each seem like the possible culprit at one time or another: Hans is a jovial assassin that kills people for money; Flamie is revealed early on to be the killer of numerous potential Braves; Goldov is fanatically loyal to Nachetanya and jealous of her growing relationship with Adlet; Nachetanya is naive and sheltered, prone to emotional outbursts; Mora is fixated on Adlet’s guilt to a disturbing degree; and Chamot, while the most powerful of the group, is also the most arrogant—sure that she can defeat the Demon God alone if it comes down to it. Moreover, each character is so powerful in his or her own right that the idea that any one of them is working for the demons is terrifying. However, surrounded by truly superhuman men and women on all sides, Adlet still has the audacity to call himself “the strongest man in the world.” The other Braves scoff at the idea, treating him as a fool even before they decide he must be the imposter. After all, when it comes to physical strength, Goldov is obviously stronger. In pure fighting skill, Hans also surpasses Adlet. In pure knowledge of the world and the Saints, Mora is the superior. In fact, while he can hold his own, it’s implied that any of the other six could likely beat Adlet in a one-on-one fight. Yet, by the end of the story, it is obvious, even to them that Adlet is indeed “the strongest man in the world.” It is not strength, skill, wisdom, heart, or luck individually that makes one “the strongest man in the world,” but a combination of all. This is the anime’s core message: Only a truly balanced person (as we should each aspire to be) could escape the trap set for him and solve the mystery. The other high point of Rokka is the developing relationship between Flamie and Adlet. Flamie and Adlet each have similar backgrounds. Both were betrayed by those close to them and set out on a path of revenge. Both decided to lock away their hearts and emotions to achieve their respective goals. But despite their common histories, Adlet eventually has it (literally) beaten into him that revenge is a dead end and your emotions can give you the strength to go on even in the darkest moments. Instead of avenging a loss, it is better to work to stop another, similar loss. However, there was no one to teach this lesson to Flamie, so she continues to seek only revenge and her own death—preferably both at the same time. While Adlet sees everyone as an ally (unless proven otherwise), Flamie’s world is made up of two kinds of people: enemies and potential enemies. But, of course, deep down she wants to trust people as Adlet does. However, she has decided that it’s better not to believe in others at all rather than to believe in them and be betrayed. That is why she hates Adlet. He makes her want to believe in him. Again and again he says just the right things to appeal to her—which makes her feel manipulated (despite his sincerity) and so she hates him all the more. This is why, when he finally proves his sincerity beyond a shadow of a doubt, she breaks suddenly and completely—becoming fanatically loyal to him in an instant. He becomes the single person in the world that she trusts—and trusts completely even though she doesn’t want to. In her world there are now three types of people: enemies, potential enemies, and Adlet (i.e., the only one that matters). While a dramatic change, it is well done. And voice actress Aoi Yuuki acts the part excellently—giving a stark contrast between Flamie’s usual monotone and her much more caring voice after her change of heart. At the end of the anime, all seems resolved. We learn the secret of the locked room mystery, who did it, and a least a bit of that person’s motive. But in a story so full of twists, it can’t resist a final one as a new “Seventh Brave” appears before the group. This final twist throws into question all you have come to know. Once again everyone is a suspect and everyone’s innocence is no longer proven. This is so effective because the backstories of many characters are vague at best—including Adlet himself. Only Flamie, due to her emotional state and large amount of character development, seems above suspicion. In other words, Rokka’s ending does what the best endings do: leave you longing for more. 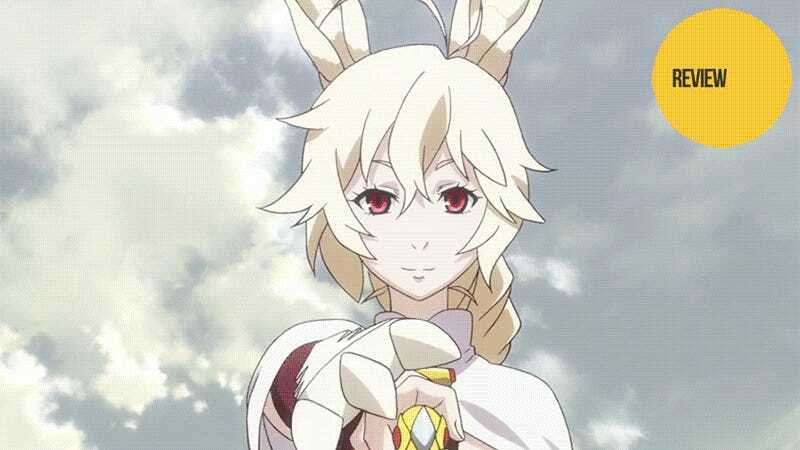 Rokka: Braves of the Six Flowers is an excellent anime. It is far from what it appears at the start; what it becomes is captivating as Adlet is forced to battle those who want him dead but he knows he cannot kill without dooming the world. Supported by strong characters, the melding of mystery and fantasy keeps you guessing right until the very end—where it starts you guessing again. Rokka: Braves of the Six Flowers aired on Tokyo MX in Japan. It can be viewed for free anime with English subtitles on Crunchyroll.